Safety at Work features articles from 25 specialist contributors written in association with the Institution of Occupational Safety and Health. This third edition of the book contains revisions to reflect developments in health and safety legislation and to rationalize the structure of some of the chapters. This book is organized into 31 chapters. Several chapters from the second edition were revised. Chapters on occupational safety law were combined into one chapter. The Management Techniques and Behavioral Science chapters were also combined in to Management of Risk to reflect the growing importance of broad based risk control strategies. 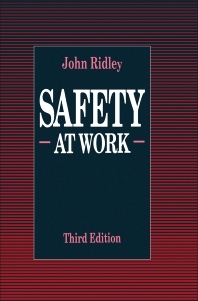 A chapter on the employer's obligations for safety was included to replace the behavioral science techniques chapter and the practical day-to-day engineering application of physics and chemistry techniques was retitled Engineering science. A new chapter on the safe use of chemicals has also been added to cover with the important field covered by the Control of Substances Hazardous to Health Regulations 1988. This book will be of interest to occupational safety professionals and others interested in workplace safety. 13.1 What is Behavioral Science?